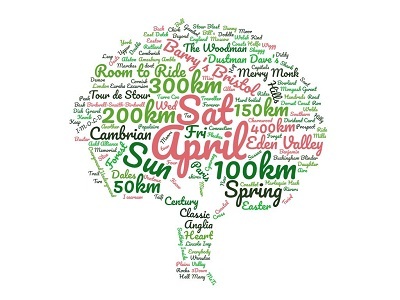 As the days get longer, the options are increasing - more than 80 rides in April, with 6 x 400km events and 16 x 300km. Fancy a challenge - how about 400km and 6.75 AAA points? At the other end of the scale there are 50km rides perfect for getting younger and less experienced riders started. Just go to Choose a Ride, and enter. Or maybe this month's passenger? 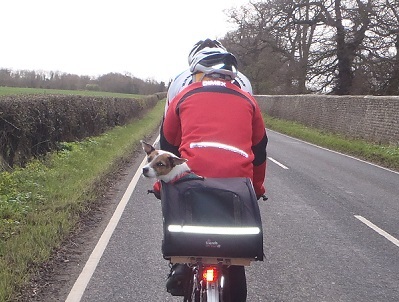 This is Chalky, on VC167's Ripon Canter 100km, with Vicki and Paul doing the work. March was unusually warm this year, which should have helped the riders, but on the other hand we had storms Freya and Gareth to contend with, which made things trickier! Please note that whilst this website is in development, entering events and viewing results will redirect to the previous Audax UK website.